If you’re in the market for body armor, there are a few things to consider before you make your purchase. While the most obvious is threat level protection, comfort and conceal-ability often go overlooked. 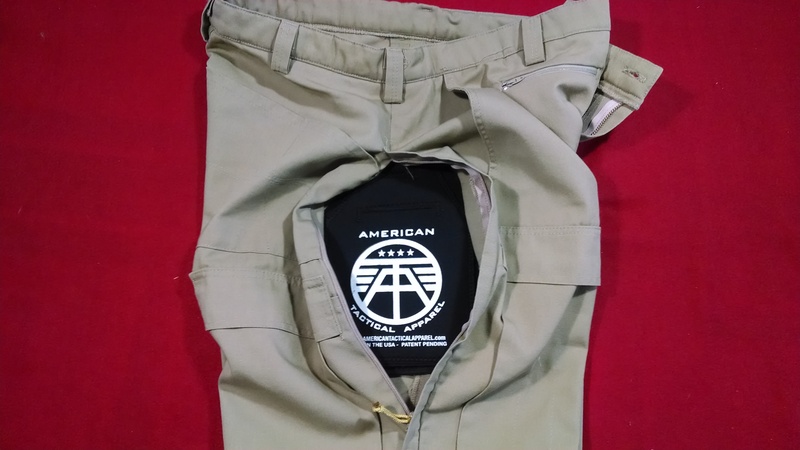 Recently, I was able to test and evaluate a product from SafeGuard Armor that exceeded my expectations. The armor up for review is their Stealth model vest configured for level II ballistic (up to .357 magnum and handgun barrels up to 6″) and level 1 edged blade protection. Another available (but not added in this test unit) protection option is spike protection (non-bladed weapons). It is manufactured with DuPont Kevlar, weighs 4.9 lbs. (+/- 0.2 lb. ), is available in black or white, and has a price tag of $476 (tested configuration). There are many protection levels for this vest, and a Pro model is available that facilitates 10″ x 12″ plates for added protection. 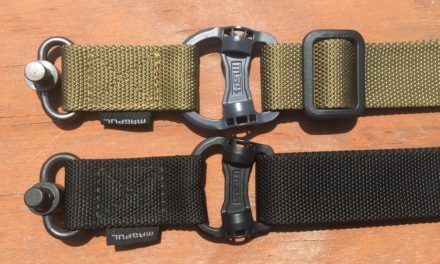 Before we move on to the ballistic and blade testing, I want to share my experience with this specific product, and the company that manufactures it. The comfort level of this vest was outstanding. 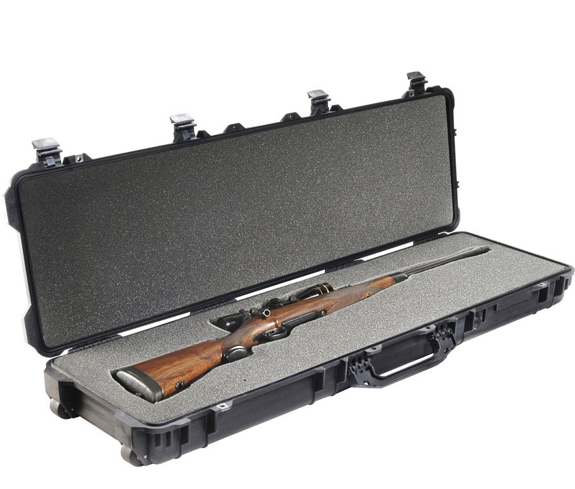 Although the weight of this product is about five pounds, the carrier does a great job distributing the weight over the body. The design is for covert (under clothing wear) and I did spend a few days in it running errands, which included getting in and out of a vehicle numerous times, bending, reaching, twisting, and leaning. It stayed in place better than other armor that I’ve worn in the past, and I don’t remember having to pull at it for adjustment. I wasn’t overheated while wearing it (August-September in the North East), and I was surprised at how well the CoolMAX carrier worked. The panels do have some rigidity to them, but do conform to the body well. In fact, this vest offers great conceal-ability. While I was wearing it (concealed) in public under a t-shirt and an open button down shirt, I was watching to see if anyone noticed. Not a single second look or suspicion. The company is wonderful to work with. I contacted them (customer service) with some questions, and found that the representatives were patient and had a good working knowledge of the products that SafeGuard offers. Their website is packed with general and specific product information, along with frequently asked questions that cover the basics such as “What is body armor?” to the more advanced “What level of protection do I need?”. The Stealth vest offers great concealment properties. The shirt is a size large which normally fits me, and you can see how well the armor is hidden. When I wore the next shirt size up, the vest was completely invisible. Some of the other body armor I’ve worn in the past bunched up in the back. Not so with the Stealth vest. Even with the protection it provides, my range of motion is unrestricted. Sometimes body armor will bunch up around the shoulders and neck when you raise your arms. I didn’t have this issue, as it stayed in place. The label on each panel identifies the product and the levels of threat protection. This photo was taken after testing. The Stealth vest’s ability to conform to the body for excellent concealment surprised me. In fact, my testing partner didn’t notice I was wearing it when he arrived down range. Drawing, firing, and re-holstering, was smooth and comfortable. The armor didn’t interfere with any of the motions, and stayed in place during all of the testing. The following tests were performed in a controlled environment, with an emphasis on safety. Please do not duplicate these tests, as injury or death may occur. 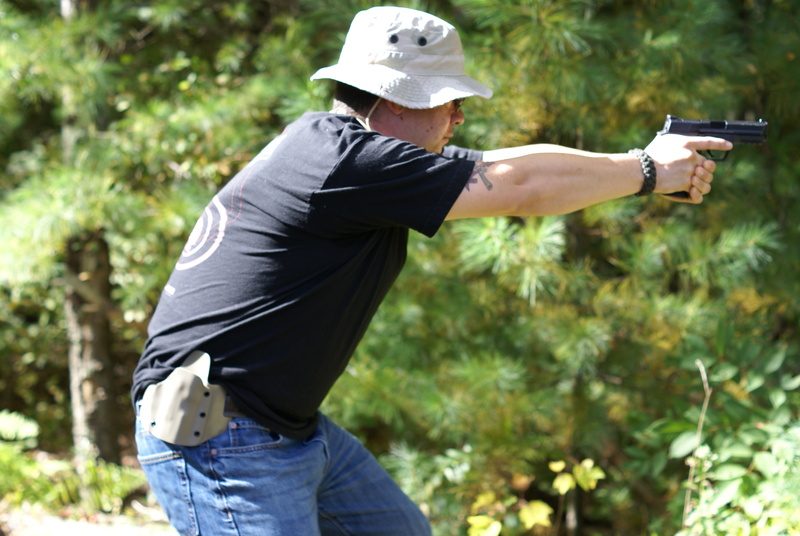 Helping with the testing and analysis is my friend Dave who is: prior military, a retired L.E.O., the range master for where the test was conducted, and a professional firearms instructor with multiple qualifications including F.B.I. certification. To set up for the ballistic testing, the vest was wrapped around a block of R-50 foam sized to simulate the human torso. This foam’s properties are firm and dense, but it does have some give to it. This will allow the vest to react more accurately (as worn on the body), versus being placed against a hard surface like plywood. Behind the vest, we placed a new piece of cardboard to show the energy transfer and impact. Since we already know that this armor we’re testing meets the U.S. National Institute of Justice (NIJ) standards ballistic protection, we wanted to show more of a real-world test instead of the lab tests that were already performed for the vest to be certified. The front of the vest was tested using a S&W M&P9 Pro (4.25″ barrel) using 9mm 124 grain +P Speer Gold Dot hollow points. The NIJ lists this particular round as a “special threat” type of ammunition. Since you never know what you may encounter in regards to projectile velocity and design, we used these because of the +P velocity rating and how the hollow point reacts with the vest. 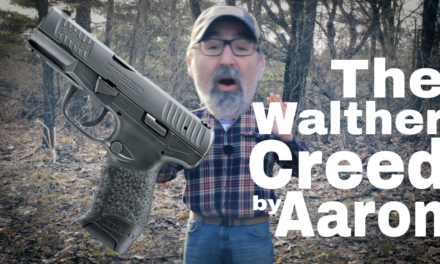 What happens is the hollow point begins to expand a small amount, and as it is caught by the vest; it closes in on its self, “bites” the vest, and twists/tears the fibers of the Kevlar due to the spin from the rifling in the barrel. You can see how this type of ammunition can be extremely destructive to soft armor vs. full metal jacket (FMJ) rounds, which normally just flatten out. Testing for the .357 magnum round was conducted on the back using a S&W 686P (4″ barrel) with 158 grain Magtech semi-jacketed soft point ammunition. All testing was conducted at 7 yards (21 feet). After discussing with Dave what the average amount of rounds the wearer may receive into the vest on entering a hostile situation, the decision was made to fire an initial volley of four rounds into a controlled group to test the endurance of the armor. While the rounds would probably be spread out more over the entire area of the vest (given the scenario), we wanted to test the panel’s full protective potential by repeatedly firing into a “compromised” area. The Stealth vest was wrapped around an artificial “skin” (cardboard) to show impact and energy transfer/absorption. Inside of those is the R-50 foam that was used as a test media. The front of the vest was used to test the 9mm 124 grain +P Speer Gold Dot Hollow Points. The 9mm test revealed that the Stealth vest was capable of taking multiple hits from the +P hollow points, as there was no penetration. Here is a side view from the 9mm test. The vest absorbed and dispersed the energy from the rounds well, resulting in the puffed out appearance. The back of the vest was used to test the .357 magnum; 158 grain Semi-jacketed soft points (SJSP). Being a proven stopping cartridge I didn’t know what to expect, considering how close together the rounds landed. With this decent group from the .357 magnum, I was impressed with how well the vest transferred the energy and stopped all four rounds. This photograph shows a side view of the .357 magnum test. The amount of energy transfer is astounding. Both Dave and I were impressed with how well the Stealth vest held up, and continued to provide protection. So what happens if more than four rounds contact the vest? 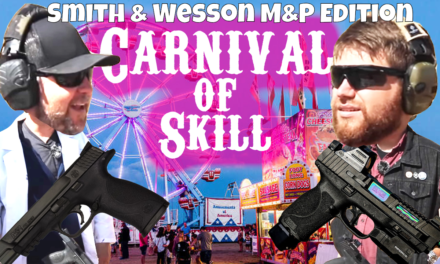 To answer this, we decided to fire an additional thirteen rounds (to total a full magazine of 17 rounds in the S&W M&P9) of the same ammunition into the 9mm side, and an additional three (to total a full 7 round cylinder of the S&W 686P) into the .357 magnum side (same ammunition as well). To be honest, we were expecting the panels to fail and allow the penetration of at least one round of each test ammunition. We figured that since the vest is already compromised from the first rounds fired, it was going to fail. We were wrong on that one. The exterior examination revealed that while there was some tearing in the rear (body side) of the CoolMax carrier caused by friction, all of the fired rounds were captured by the panels. No penetration what so ever. Well played SafeGuard Armor….. well-played. *Neither SafeGuard Armor or I recommend reusing a vest that is compromised for protection, regardless of how little damage it has received. An additional thirteen rounds of the 9mm 124 grain +P Speer Gold Dot hollow points were fired into the Stealth vest for a total of seventeen. The panel captured all of them. The dark circles are the original four test rounds. Here’s the artificial skin showing the energy transfer and impacts from all seventeen rounds. The black dots are the first four test shots. Here’s the results of the impact/energy transfer from the .357 magnum tests. The fact that the rear panel took seven rounds of .357 magnum impressed us. The fact that there was no sign of near penetration impressed us more. The black circles are the original four test rounds. To test the edged weapon protection, we used three different blades. The goal was to try different steel grades and see if any of them would penetrate or compromise the Stealth vest. The first used was an AUS-8 steel (SOG Trident Tanto) which is a medium grade steel commonly used in pocket knives, followed by a carbon V steel (Cold Steel Recon Tanto). While carbon V isn’t common anymore, the properties of the steel make it a hard and durable blade with superior strength to AUS-8 steel. The last test was with a machete that dates back to Vietnam era, and was issued to our Soldiers and Marines. It was manufactured by the Ontario Knife Co. using 1095 carbon steel. During the test, a variety of attacks were used to show real-world application. The SOG and Cold Steel blades were used in slash, rapid jab stab, and full strength stab attacks (with a twisting of the blade post-stab). The Ontario Knife Co. machete was used in full force slashes. While the CoolMax carrier and panel liners were cut, the interior panel performed flawlessly. Nothing made it through the first line of defense, which is chainmaille (also spelled chain mail). This maille provided outstanding protection even with the full force attacks, and it took the edge right off of the SOG (AUS-8 steel). We were impressed with the results, as the panel is rated for level one blade protection. While the outer carrier and panel liners were cut through, the maille that is front of the Kevlar stopped every attack from every blade. In fact, the knife shown here completely lost its edge. The marks on the vest are from multiple rapid jabbing stabs, and a full force stab (with a twisting of the blade). The amount of protection that the level one rating provides far exceeded our expectations. The Cold Steel and Ontario Knife Co. blades were manufactured from a hard and durable steel. We expected these to make it through…. we were wrong on that one too. Again, well played SafeGuard…. well played. We were impressed so far, but we still had the ballistic results to look at. After we unzipped the CoolMax carrier, we removed the panels. The panels were cut open one at a time to show the results. The projectiles did go through the chainmaille, as we had expected. The results of the test took us both by surprise. Below you will find out at what Kevlar layer bullets stopped at, how many were captured, and how many passed through each one. The layers will be listed to the last round that was stopped (totaling 17 rounds for the 9mm, and 7 for the .357 magnum). Remember, there are twenty-one layers of Kevlar. The panels were removed from the CoolMax carrier, and cut open. The actual panel made of maille and Kevlar is encased in a material with a moisture barrier, this helps protect these materials from water and sweat. This is the 9mm test side with the maille separated from the Kevlar. The maille is the outer most layer in both panels. You can see the 124 grain +P Speer Gold Dot Hollow Points in the vest. Also visible are the broken links of maille from the bullet strikes. While the Kevlar looks like a complete mess, this is only the first layer. There are a total of twenty-one Kevlar layers in each panel. A couple of layers back we found more projectiles. As we went through more layers, we found the rest of the bullets, and the Kevlar smoothed out showing less and less physical damage or wear. Here’s a couple of 158 grain SJSP projectiles from the .357 magnum test. The amount of expansion as the bullet flattened out shows how well the panel absorbed the energy, and distributed it throughout the Kevlar. 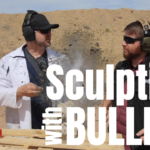 What amazed us was how few layers of Kevlar were compromised during the .357 magnum test. The last bullet was found on the sixth layer. Remember, there are twenty-one layers in this panel to capture and absorb the energy from the projectiles. Each panel has thick felt-like liner in the back of it\ (facing the body). In this picture, you can see where the rounds hit, and the energy dispersion. It’s one thing to read the ratings for body armor to make an educated purchase. Being able to actually see the ballistic testing and results gives a higher level of confidence. 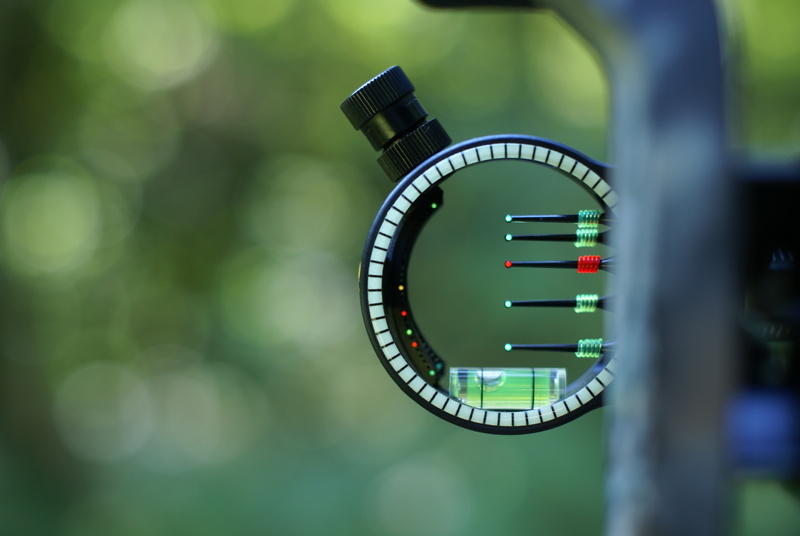 We were honored to have the privilege of testing this product, and were impressed with it. If the Stealth vest or Stealth Pro sound like they will fit your covert needs nicely, I would also like to suggest a new product from SafeGuard Armor; the Ghost vest. This new armor offers all of the same features, panels, and customizable protection levels of the Stealth, with the addition of; lighter weight, adjustable and wider shoulder straps, and the thinnest carrier possible. I hope to get my hands on one soon! With multiple threat and levels of protection available, and wearing comfort in mind, I now know what manufacturer and what products to trust. SafeGuard Armor performs when your life depends on it.